Volumetric visualizations of vortex structures identified with the lci criterion in a cylindrical gravity current. (Cantero, Balachandar, Garcia & Brock, Journal of Geophysical Research, Vol 113, C08018, 2008). Computers have profoundly changed our daily way of life. desktops, laptops, and smart-phones are all around us and their ubiquity, utility and indispensability is evident. The impact of large supercomputers is equally impressive, although their influence is indirect and may not be readily apparent to public. These supercomputers have revolutionized the way scientists and engineers solve problems of national importance and societal need. Equally important are advances in storage and network technologies that have enabled storing petabytes of information at a very low cost. We depend ever more on large-scale simulations and data-enabled science and engineering to make critical decisions such as whether it is safe to build a novel nuclear reactor, to launch a manned mission to Mars, to produce and market a drug, or to evacuate a metropolis under threat of volcanic eruption. Computational methods have clearly become the third pillar of science and engineering investigation, along with theoretical and experimental approaches. Our educational paradigm must prepare students towards this emerging reality of simulation and data-enabled decision-making in problems of industrial, national and societal importance. Modern scientists and engineers must be well trained in their respective disciplines and in computational techniques to generate high quality datasets, manage these voluminous datasets to identify key quantities of ultimate significance, establish rigorous uncertainties, and evaluate probabilistic risks and rewards involved in the final decision-making. To meet this growing challenge, the Herbert Wertheim College of Engineering at the University of Florida has established the Institute for Computational Engineering (ICE) to promote world-class education and training in simulation science and engineering. The institute will have three primary focuses: Education, Research and Service. The educational program will be credentialed by a Graduate Certificate in Scientific Computing. The institute will promote interdisciplinary research in computational science and engineering with a novel research paradigm where the focus will be on large-scale simulations and scientific data with a clear purpose of decision making. The Institute will serve as the coordinating body for promoting large center-level computationally-oriented multi-disciplinary research activities, which spans across many departments. By educating and training undergraduate and graduate students to become world leaders in using predictive simulations and data-enabled for science and engineering, the Institute will serve the growing need for simulation and data-driven decision making in problems of national importance. In summary, the education and research components of the institute will instill and encourage competitive and innovative spirit in students, research staff and faculty. The Institute for Computational Engineering (ICE) is dedicated to establishing and promoting world-class excellence in education and interdisciplinary research in Simulation Science and Engineering at the University of Florida. The institute aims to educate and train the next generation of leaders in the area of complex multiscale, multi-disciplinary problems and their resolution by computation. The institute strives to coalesce ongoing research activities in computational science and engineering into a common network of shared intellectual interest, thereby achieving far greater impact and visibility than the sum of these parts. The institute will foster collaboratory research and help attract and retain top-notch faculty and students. The institute will have a director, advisory committee and faculty members. The Institute will be headed by a Director. The term for the Director is three years with the possibility of extending with the approval of the Dean. Director appointments and reappointments will be made by the Dean in consultation with the faculty. The Director must provide leadership and guidance for the direction of the research and facilitate interaction among faculty, staff and students. He/she should seek effective means of communication and collaboration, create an efficient organizational structure, and work to identify funds to sustain and expand upon the Institute’s activities. Members of the committee will be chosen by the Institute Director, with approval from the Dean, and will consist of at least one member from each participating department. This committee, chaired by the Director, will be a significant contributor to the intellectual direction of the Institute. It is responsible for making recommendations about the allocation of Institute resources as they become available. 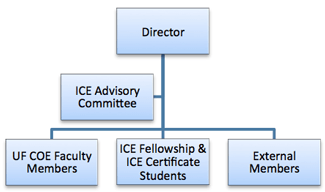 The Institute Faculty Advisory Committee is also expected to engage groups with complementary interests, provide leadership within the College, and provide counsel to the Dean’s office regarding the Institute’s specific interdisciplinary research areas.